It’s a weird thought. Why would someone be surprised when a movie is exactly what you’d expect from a certain director? Why should anyone be shocked that Transformers: Dark of the Moon was anything less than a stereotypical Michael Bay movie? Well the answer is that you shouldn’t be. Dark of the Moon was a tribute by Bay to Bay, exploiting (once again), all the things that he has built his movie legacy around. There were actually points of improvement in this movie, in comparison to the first two Transformers films. One of the main critiques with the first two movies came in the way Bay shot his action sequences. While they were very elaborate and well thought out, they moved at a speed that could induce motion sickness. Improved upon in the second movie, Dark of the Moon nails the action sequences like no other Bay film has. Almost every action scene is put into slow motion, allowing the audience to actually watch the intricate battle battles. Another element to any Bay film is an overall lack of a strong plot and educated dialogue. While the dialogue won’t be winning any writing awards (see Shia LaBeouf yelling “Run” about 36 times), the plot is actually visible. Take a step back and try to remember the point of the second Transformers movie, Rise of the Fallen. Can’t really put it all together? That’s because it was almost non-existent. Dark of the Moon features a plot that’s easy to understand and follow but complex enough to feature a few solid twists. This shift for Bay also saw him bring in a host of new actors and actresses to help solidify a cast that hasn’t changed much over three movies. Patrick Dempsey, Frances McDormand, John Malkovich and Ken Jeong help bring depth to the movie in a way that running, screaming actors and actresses can’t. The nerds out there will appreciate another huge addition to the cast. With original voice actor Peter Cullen voicing Optimus Prime and Hugo Weaving voicing Megatron, Sci-Fi legend Leonard Nimoy steps in to play Sentinel Prime, one of the movies focal points. The largest change to the movie was the removal of Megan Fox as LaBeouf’s love interest. She was replaced, almost seamlessly by british actress Rosie Huntington-Whiteley, who’s previous experience is as a Victorious Secret model. How Michael Bay is this? To replace Fox, someone who had openly complained about Bay’s exploitation of women in his films, why not bring in someone with zero acting experience? This was a middle finger to Fox if there ever was one. Rosie’s presence in the movie serves as eye candy. If you thought there were a lot of scenes featuring a half naked Fox in the first two movies, you haven’t seen anything yet. With almost no inhibitions, Rosie spends a huge amount of time changing clothes, or bending over in front of the camera. As if Rosie was in the room when Fox told Bay she didn’t want to be exploited, she seemed to embrace the arrangement. When push comes to shove, you have to remember what type of movie you’re going to see. Will this movie win any major awards? No. Will it make a lot of money? Yes. The movie is totally worth the price of admission, acting as a perfect summer blockbuster and showing that Michael Bay might actually be listening to his fans. 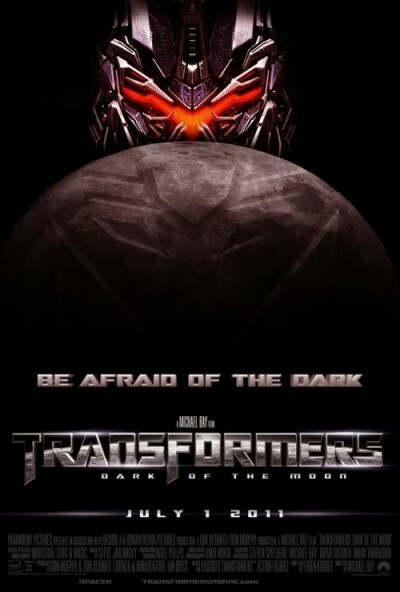 The improvements over the last Transformers movie are glaring and Dark of the Moon is a winner.